The United States is drawing down its presence in Afghanistan, but a top watchdog said Tuesday that corruption there is on the rise. "It's getting worse.… Significantly worse," John Sopko, the special inspector general for Afghanistan reconstruction, told reporters at a breakfast roundtable. "Corruption is not only feeding insurgency, it's feeding a number of corrupt officials." 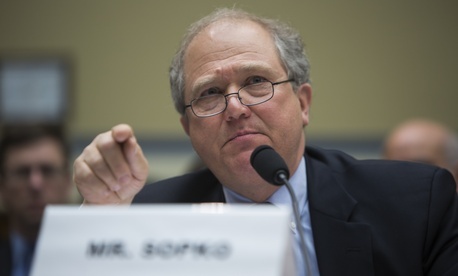 Sopko leads the office responsible for tracking down waste, fraud, and abuse in U.S.-backed projects and helping to reclaim misused taxpayer dollars.The United States has allocated more than $104 billion for reconstruction efforts in Afghanistan, and President Obama's fiscal 2015 budget would add an additional $5.8 billion. "They can't afford the government we've given them," he said. "If you go over there, it's like Disneyland, what we bought for them.... It isn't working if you approach reconstruction that way." The Afghan government—and the country's economy—relies heavily on foreign investments. But Sopko said there's been no point person for overseeing the building of a self-reliant economy. That is indicative, he says, of the larger problems facing the country. "I can not find anybody who's lost their job for screwing up, and there have been a lot of screwups in Afghanistan, and that's a problem," Sopko said. "It seems like nobody is responsible for anything in Afghanistan.… It's almost like a toddler's sports game—everybody's a winner." Sopko was appointed to his post in 2012, and since then he's had a turbulent public relationship with those he audits—including the State Department, the Defense Department, and the U.S. Agency for International Development. His office frequently releases reports detailing millions of dollars in potentially misused funds. For example, a report released last month found that the United States spent $3.6 million on TV trucks that aren't used. Another released earlier this year found that the U.S. spent roughly $3 million on boats for an Afghan navy in 2010 to help patrol a river it shares with Uzbekistan. The ships, according to the report, are sitting in storage in Virginia after the order was canceled. Sopko pointed to both instances as examples of U.S. money that could have been better spent. "Just think of it: To buy a prosthetic in Afghanistan—and there are a lot of kids, there are a lot of adults, who have lost limbs—I think a prosthetic, what, is it $50 to $75?.… I think that kids would have loved to have legs, rather than having balloons and kites and TV trucks that are still sitting under wraps." In response to Sopko's reports, the military set up a plan of action, detailing how it can get ahead of him and defend its programs against his reports. But the outspoken inspector general is well aware that his office has ruffled feathers within the U.S. government. "We speak the truth, and sometimes people don't like it," he said. "Every time we issue a report, we gore somebody's ox." Central Command, which oversees U.S. military operations in the Middle East, North Africa, and Central Asia, was unable to immediately respond to comment.